How to design your Bedroom? Interior Design of a bedroom is very critical for interior decoration of any residence. This is a private space and needs to get tranquility for the resident after a stressful day. Such a space can be designed by making sure that all the human senses are touched upon in the right proportion and we do not get overboard in conceptualising the space. There are various aspects to this and we at Green Hat Studio have tried to list a few below. Function: This is the basic and should not be compromised in any which way. Proper bed sizes, wardrobe sizes or any other furniture placed, should serve the purpose and should be proportionate to the room size. Sometimes an oversized bed can make the room look small physically which in turn can have a psychological impact on the what you feel while using the room. Also adequate space should be provided for circulation around the bed and in front of the wardrobe. Now with the room sizes getting smaller by the day, it can be tried to push the bed in one corner to create enough circulation space in the center of the room. Now a days there are various ways of using foldable beds which in turn can help you achieve the much needed relief in the center of the room. Colour: Colours have to be in harmony with each other. Anything too bright or too contrasting can be disturbing to your mind and hence may not be relaxing enough. Even if dark shades are used, care should be taken to avoid surprises and flow of colour is maintained throughout. A highlight wall behind the bed with a simple painting is not a bad idea as it will help to make the space look inviting and will add character to it. Artificial Lighting: Uniform, consistent light of 100-200 lux is recommended in the room with task light of 300 Lux. We usually recommend colour temperature of 3000K – 4000K in bedrooms. Light should be indirect as far as possible so that it does not come in contact with the eyes of the user and make him or her uncomfortable. COB light instead of panel LED light can be used to achieve this. Plants: Small planters in vacant corners of the room are not a bad idea and should be done to break the visual hardness which is brought in by use of wood and other finishing materials. Along with visual balance, plants can also help in purification of air inside the room. There are wide variety of indoor plants available to serve the purpose. Storage: Instead of spreading the furniture horizontally, it is highly recommended to go for vertical storages specially above the wardrobe. Since that space gets wasted and is prone to gather dust, it is wise to cover it and use it for materials that are not so frequently used. Space below the bed is another source of storage that can be used with the help of drawers or by using hydraulic pumps to open the top of the bed. Material finishes: Flooring can be in wood, carpet or any hard flooring like tiles, marble or granite stone, Furniture can be in laminate, veneer or any solid colour PU finish. Walls can have paint, paneling or wallpaper. The materials listed are broadly used now a days but one should not be restricted to these only as many other different materials can be tried with. 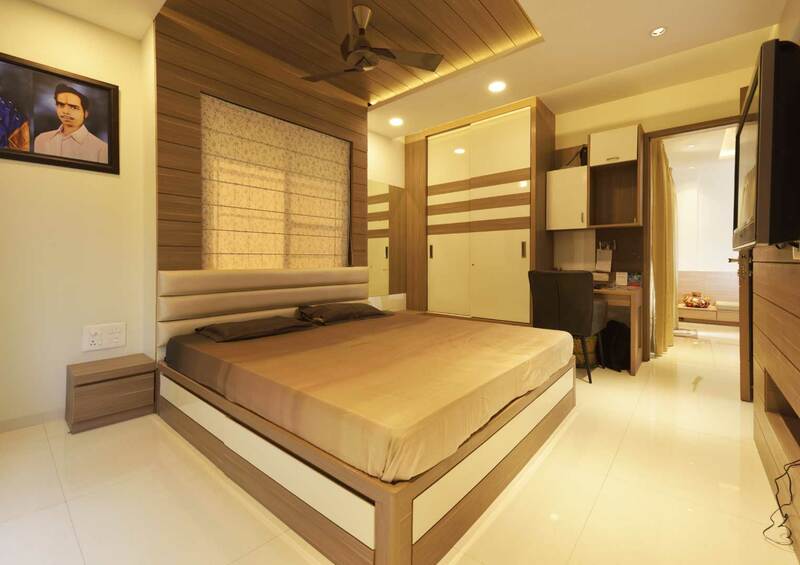 To conclude, a good bedroom design is culmination of all the above ingredients into one space that can give you the positive energy, warmth and comfort required after a stressful day.